Argentina had surprised and delighted us at every turn. From the natural wonder of Perito Moreno Glacier and the fantastic hiking around El Chalén, to the desert landscapes of Salta and the vineyards of Mendoza, the diversity of Argentina was remarkable. 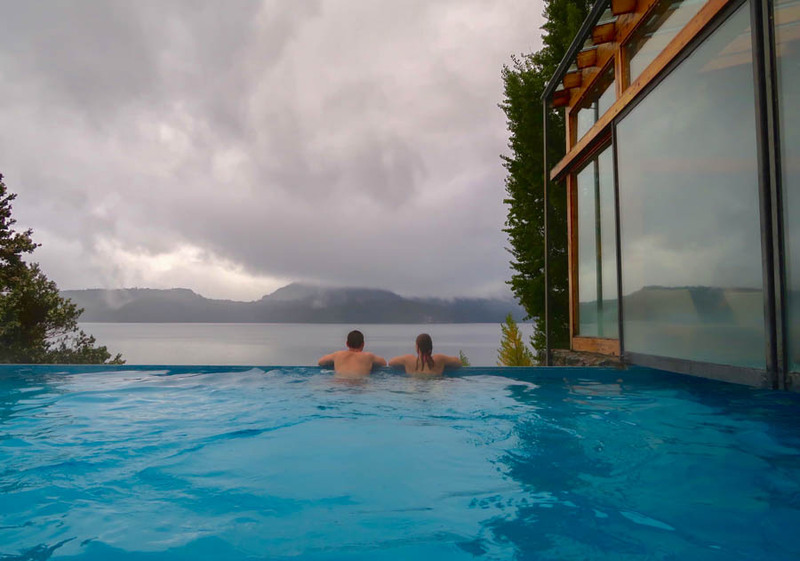 After spending a few days relaxing in Bariloche and getting our first taste of the Lake District, it was time to delve deeper into the region and explore the National Parks. 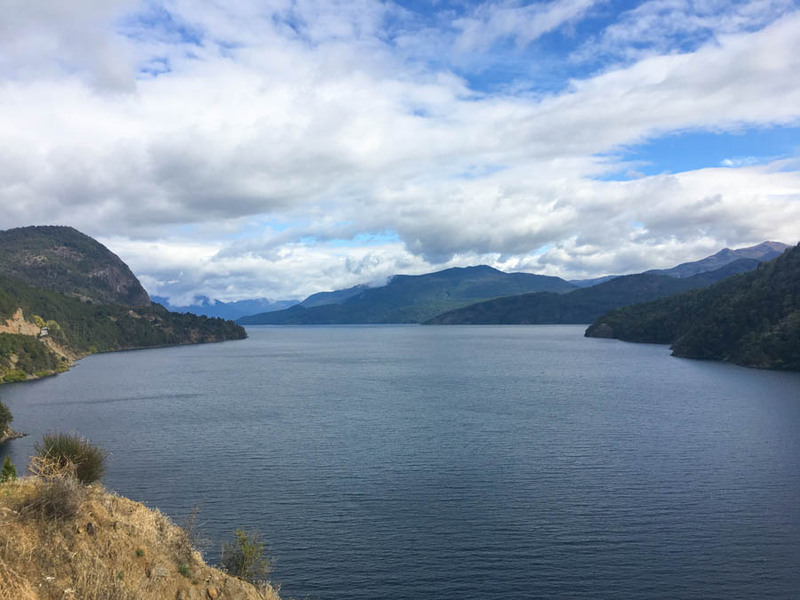 There are many drives and routes you can do, but we opted to see the villages of Villa La Angostura and San Martín de los Andes, as well as Lake Lolog. Don’t miss our traveller tips and travel videos at the bottom of this post! We packed up the rental car and set off on the famous Seven Lakes Route. You would think that there would be seven lakes (as the name suggests), but there are actually eight. I have no idea why it’s not called the Eight Lakes Route?! 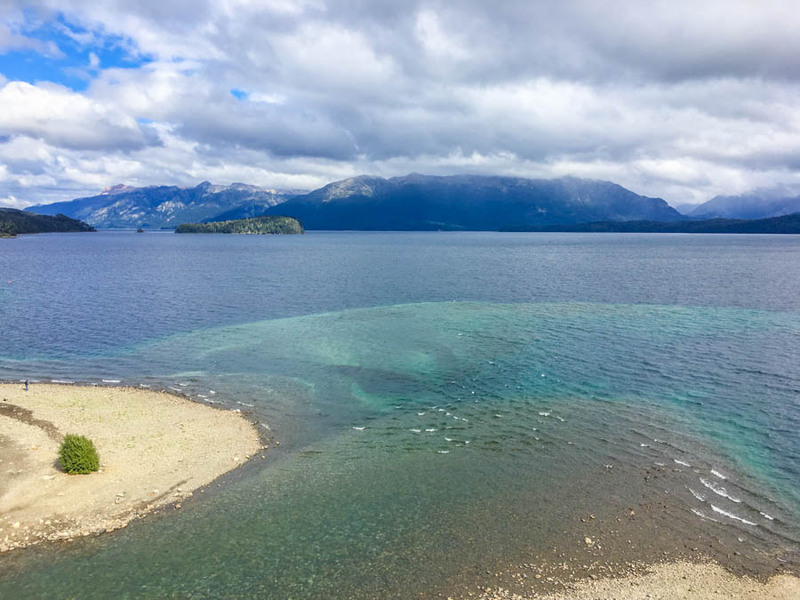 This area offers 8 different lakes (Nahuel Huapi, Espejo, Correntoso, Escondido, Villarino, Falkner, Machónico and Lacar), plus 2 National Parks – Nahuel Huapi and Lanin. 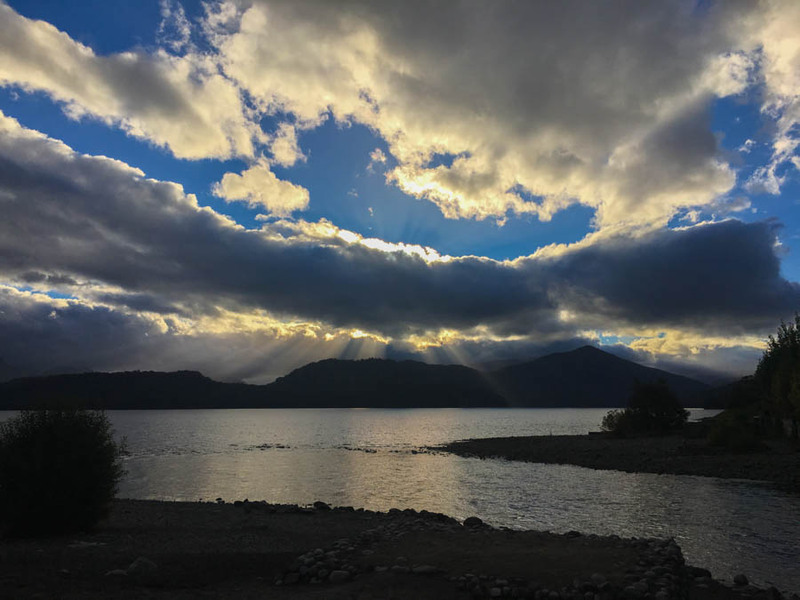 The official Seven Lakes Route starts in Villa La Angostura and runs 184 kilometers to San Martín de los Andes, with many people driving from Bariloche to San Martín de los Andes and back south to Villa La Angostura in just one day. However, since we had our wheels for 4 more days, we decided to take our time and really enjoy this pristine area. 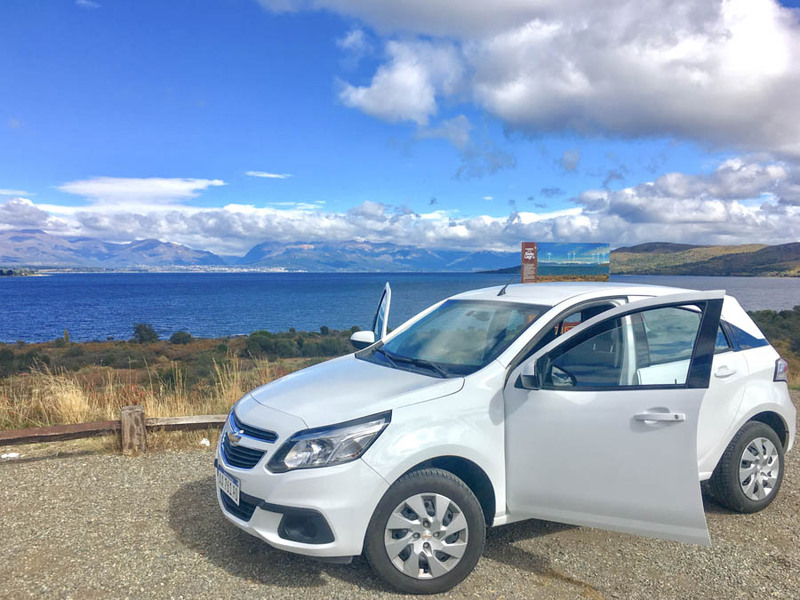 The total drive from Bariloche to the town of Villa La Angostura was only 84 kilometers, but after driving for just 20 minutes, we already wanted to pull over to take a photo! The sun was shining, the sky was blue and the view of Lake Nuhuel Huapi and Bariloche was too good to pass up. After that photo, we had a few more pockets of sunshine, but we basically saw nothing but rain for the following 4 days, which didn’t stop us from enjoying the nature whatsoever. 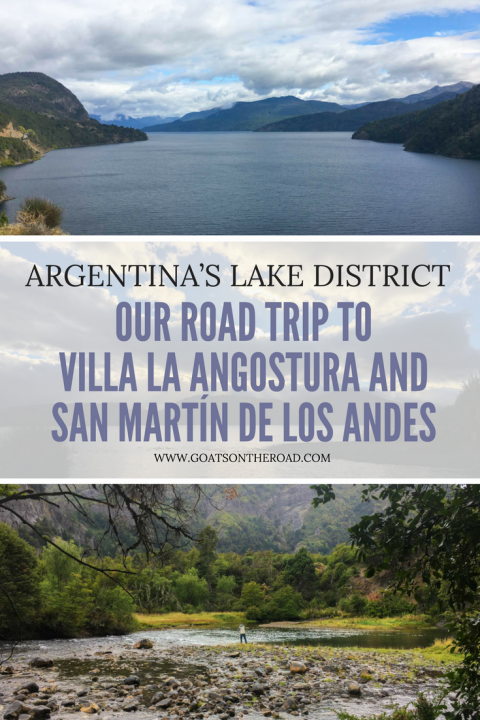 We pulled in to the little town of Villa La Angostura, passed by numerous shops selling fishing, hiking and camping gear, and continued through to just outside of the town where our hotel was located. Perched on a hill above the lakeshore, at the mouth of the river with the same name, was the gorgeous Correntoso Lake and River Hotel. This would be our home for the next two nights. There were a few clouds in the sky, but we were still able to see the views of the Andes Mountains from the window of our beautiful room. The natural setting of this Patagonian hotel was perfection. 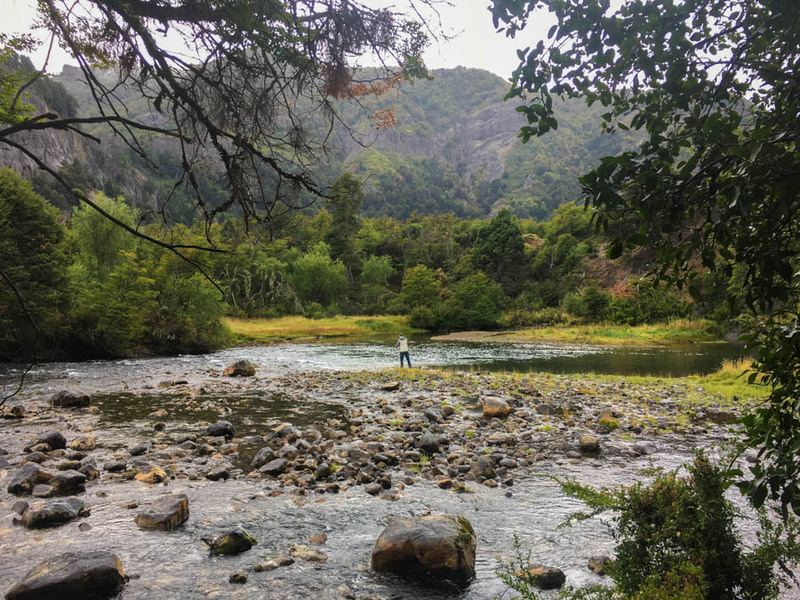 We were surrounded by Nuhuel Huapi Lake, Correntoso Lake, the fly-fishing mecca of the Correntoso River, and pristine forest! This is what the view from our balcony looked like on a sunny day – gorgeous! Celebrating 100 years of business this year, Correntoso Hotel is something of an institution in the area. 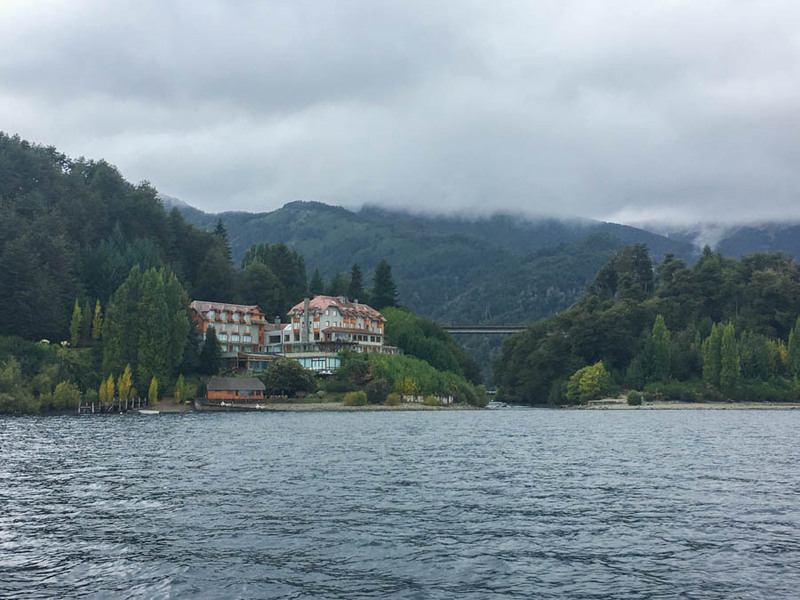 In fact, before the roads were built, there used to be a boat shuttle service that would take passengers from Llao Llao just outside of Bariloche, across the Nuhuel Huapi Lake and arrive at the dock at Correntoso Hotel. These days the hotel’s wooden dock is used mostly for anglers who travel here to try their luck at catching trout, grayling and browns, plus this is where the boat leaves for lake tours run by the hotel. Because the weather wasn’t really on our side, we had no choice but to drink wine in the hotel’s bar area, dine on locally sourced meals and spend time at the hammam and spa! This hotel had the best heated pool I’ve ever seen. The air outside might have been chilly and drizzly, but the pool was hot and a great place to relax. With steam rising off the water and the nature surrounding us, the spa was a very romantic place. We went for some scenic drives, enjoyed a nearby walk along the river, and a colourful sunset from the lakeshore. We also went on a quick boat tour of the Nuhuel Huapi Lake with the hotel. If (when) we return to this area, we’ll definitely plan it for the summer months so we can experience all of the outdoor activities that the area has to offer – kayaking, boating, fishing, etc. Being here in the autumn was great in terms of there being no crowds, but the weather wasn’t the best. Continuing north on Routes 231 and 40, we passed by Espejo Grande Lake, Tratful Lake and the shores of Villarino and Falkner Lakes. We did our best to enjoy the drive, and pulled over to the viewpoints even though there weren’t really any views. 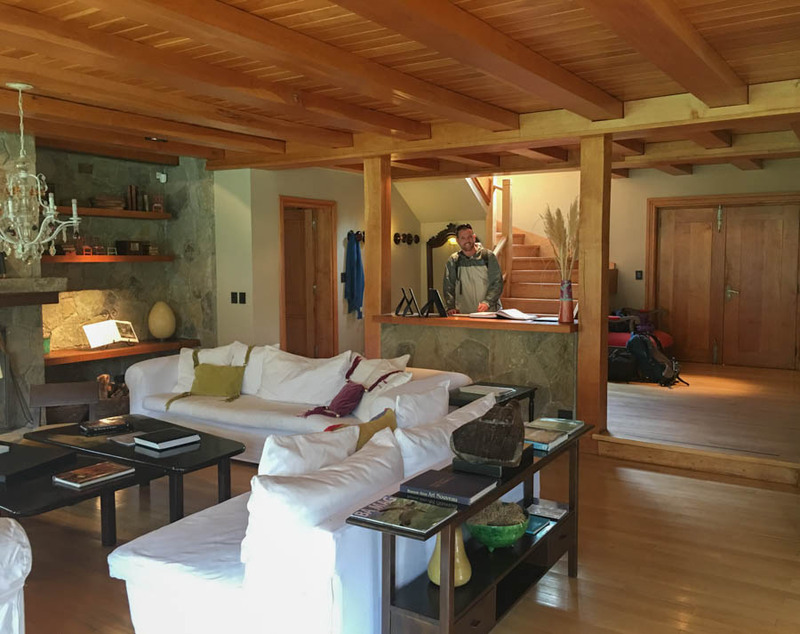 We were actually staying about 30 minutes from the town of San Martín de los Andes at the Río Hermoso Boutique Hotel in the Lanín National Park. We spotted the sign for the hotel and turned down the bumpy, dirt road. We were in the middle of nowhere, and it was fantastic. Set right on the banks of the Río Hermoso (Beautiful River), was the hotel we’d be staying at for the next 2 nights. We were greeted with a warm welcome from the staff, and a pot of tea to enjoy while gazing out at the river. Our bedroom was huge and tastefully decorated. The kingsized bed was the best we’d had and the balcony overlooking the river was a nice touch. Our beautiful room at Rio Hermoso Boutique Hotel – complete with bathtub! The Lake District is one of the most popular fly-fishing spots in the world. 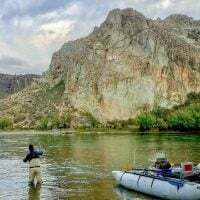 It didn’t matter that we were visiting at the very end of the fishing season, by the time we got to Río Hermoso Hotel, Nick was determined to get out onto the river and have a few casts. The drive from our hotel to the town of San Martín de los Andes was gorgeous. The sun peeked out from the clouds and the scenery looked completely different from the days before. The lake was glistening and there were some really nice lookout points. San Martín was a quaint little town with a nice beach, lots of shops geared towards fishing and other outdoor activities, and numerous restaurants and hotels. 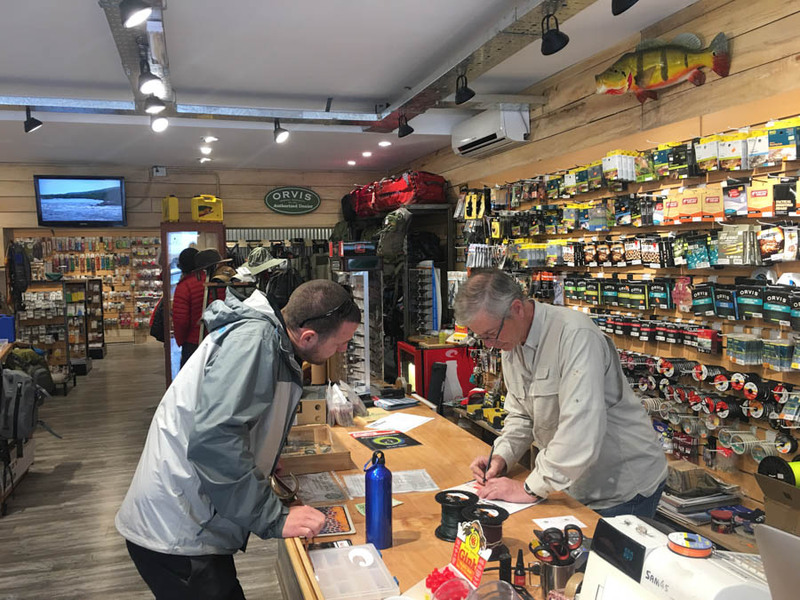 It didn’t take long to find a rental store and between our basic Spanish abilities and Google Translate, we got Nick kitted out with fishing equipment and a permit in no time! We were given some local advice that the river leading into Lake Lolog was an excellent spot to catch some fish. After driving for about 30 minutes, the asphalt soon turned to dirt. This was a proper road to a fishing lake! Being out in nature is what we wanted from our Seven Lakes Road Trip and we found the ideal spot to do just that. The river had a sandy embankment perfect for a picnic. Numerous birds were flying overhead, including kingfishers who were spotting their meal from high in the trees. It was such a peaceful spot. 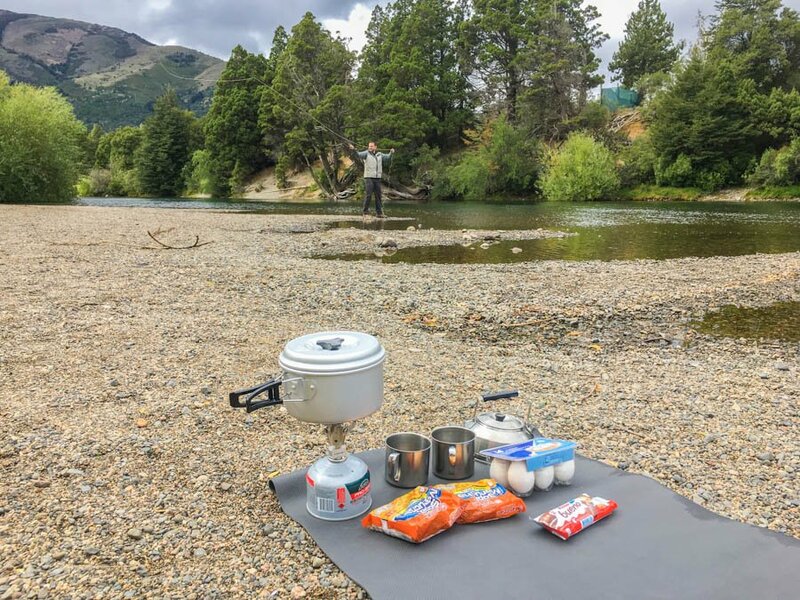 I cooked up some lunch on our portable stove while Nick was casting out into little pools in the river. We spent about 4 hours riverside accompanied by a dog, some birds and a couple of locals, the only thing missing was a fish! We returned to the Río Hermoso hotel where I dined on freshly caught trout. It many not have been caught by Nick, but it was delicious! Nick opted for the venison and we chatted about our time in the region over a bottle of wine and decadent dessert. The following morning, still anxious to get a bite, Nick headed out to the river next to our hotel and gave it another go. Usually this river is excellent for catching fish, but not this time. 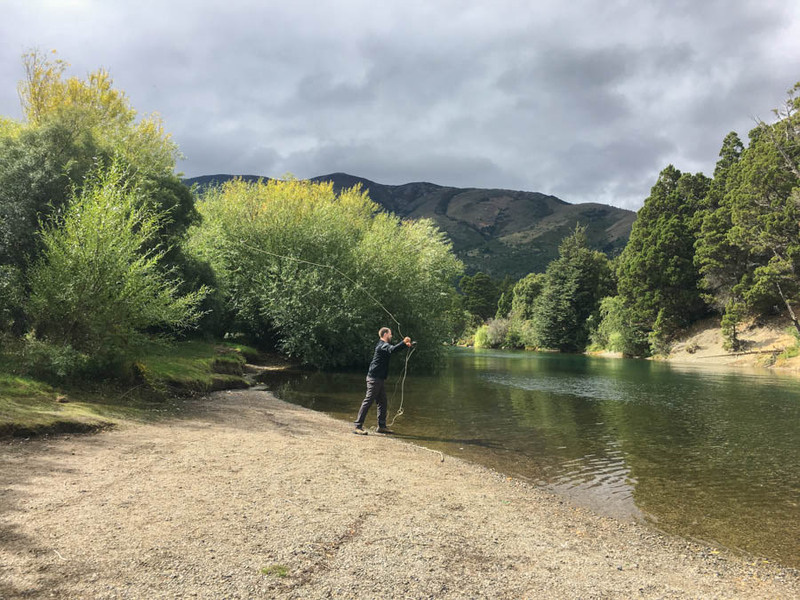 Nick may not have caught any fish here, but his luck would change when he headed out with Wilderness Patagonia – the pros! Nick giving it one last go on the Rio Hermoso river! Having a rental car is by far the best way to see this region. You can stop where you want to and get out to take photos and to stretch. Plus, it’s a great way to get to those far away fishing spots! 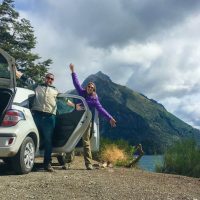 We rented our car through Hertz Argentina, and are glad we had it for this part of Argentina. If you can, try to time your visit for the summer months, or shoulder season. We were in the offseason pretty much, which is why we had rain. Many Argentines come here during the high season (summer and winter) so keep that in mind when planning your trip. You can rent fishing gear in San Martín de los Andes. For 24 hours, the cost of a rod and is 450 pesos ($29), and flies are $1 each. A one day fishing license (yes, make sure you get one, we were asked by the rangers) costs 480 pesos ($31). Bring a mess kit and pocket stove with you for this road trip. There are numerous places where you can pull over and make yourself some lunch! 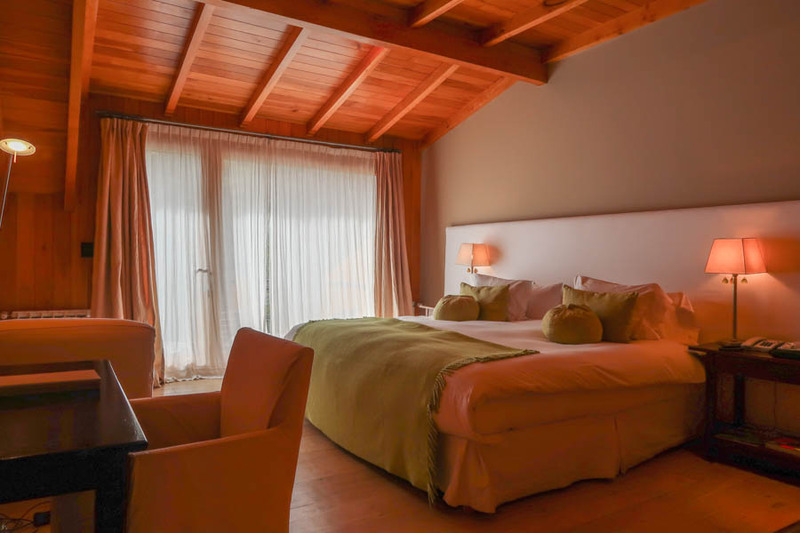 We stayed at Correntoso Lake and River Hotel and Río Hermoso Boutique Hotel and highly recommend them both for service, quality and location. If you’re on a smaller budget, or if you want to stay in Villa La Angostura town, check out Market Apartments. A huge thank-you to Destino Argentina for assisting with our accommodation and rental car during our trip to Bariloche! The rest of the Lake District we planned, booked and paid for ourselves. All opinions and thoughts remain our own, despite any complimentary services received. After deciding that we wanted to travel to Argentina, we reached out to Destino Argentina, who became our amazing partners for this trip! The reason we’re able to partner up with wonderful companies like this is because of our travel blog, and loyal followers (you!). If you’re interested in starting a blog and eventually working with tourism boards, tour companies and airlines all over the world, click here to get started. If you start a blog using the link in the article, we’ll send you our pro blogging eBook, free! Great Post with an Amazing Idea. Road trip has it’s own craziness. Thanks for the article, we are actually dreaming of a bicycle trail in the region, the Ruta Austral, which looking at your experiences, should be amazing landscapes and adventures. 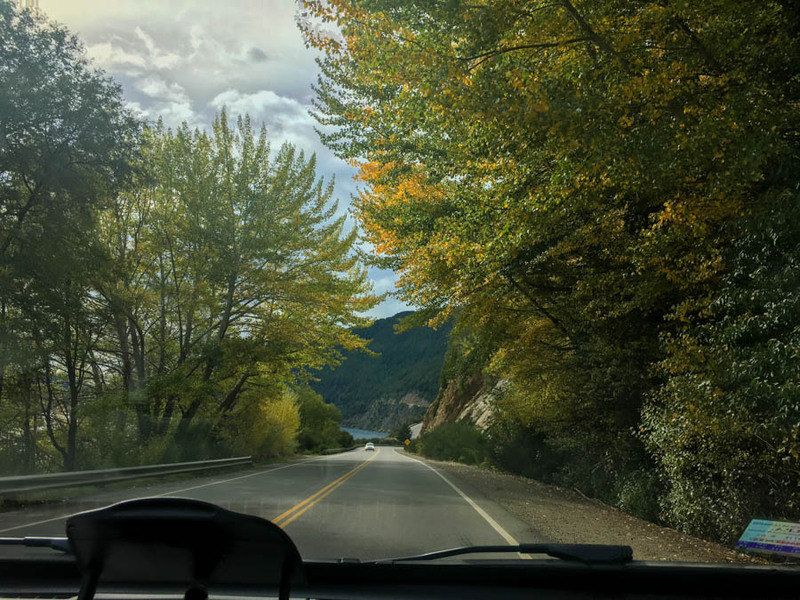 Brilliant blog and the fantastic pictures you captured in your road trip, awesome lake and beautiful Rio Hermoso Hotel thanks for lovely sharing.